If you look up the word シュシュ in Google, you'll find out that it means "chou" and that a chou is a scrunchie. I asked Abigail of Abigail's Craft How To how to pronounce it, she said "shu-shu". There is a loom that's available in Japan for making them. It's a very simple pegged knitting loom. (Japanese site) This weekend, my husband and daughter teamed up to make me one. The pegs are a little long and there are a couple other modifications that we've talked about making. But the chou on the loom is one that I knitted out of thrifted vintage acrylic yarn. I don't have any fuzzy or furry yarn handy or I've have tried it out of that. The wide open knit has a lot of stretch, and there is elastic in it as well. 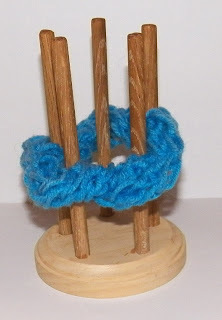 It's super easy to make scrunchies on the loom. They will probably make a few to sell in my Etsy shop. First there are a couple things that I want to work out. I'm not a fan of acrylic yarn usually, this is from The Amazing Turnip Girl's stash. 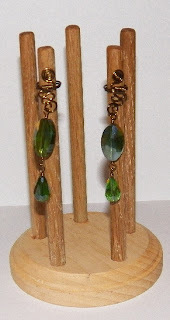 This weekend I also made a pair of ear cuffs, that I'll be posting instructions for on Beadwork at BellaOnline later today. After trying a few ways to photograph them, I finally just put them on the loom. 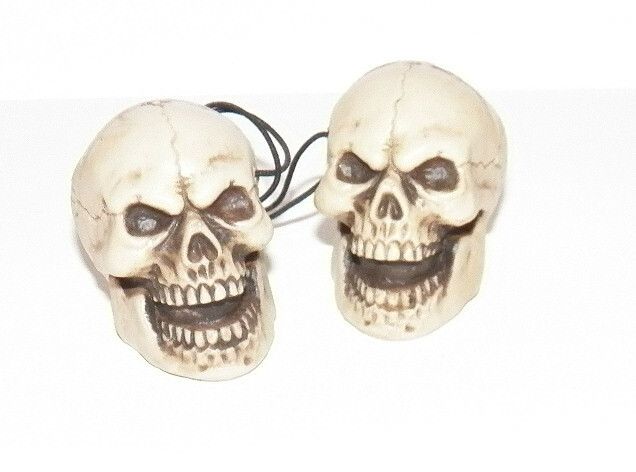 I also made myself a very large hair bobble using tabletop skulls from Halloween. I'll post instructions for hair bobbles later this week! Awesome!! Ty as always, Love it all Shala!